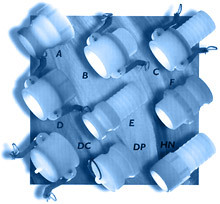 AIMS' acid resistant PVDF (Kynar) cam operating couplers offer high resistance to abrasion and temperature variability. The longest lasting type of cam couplers, they are the best choice for corrosive chemical, ozone and high radiation applications. Interchangeable with metal or plastic, manufactured to mil spec. Cam Couplers also available in Polypropylene and glass filled Nylon. For pricing please Contact us! Item Description 1/4" 3/8" 1/2" 3/4" 1" 1-1/4" 1-1/2" 2"
 On 1/4", 3/8" & 1/2" sizes the coupler and adapter portion is to 3/4" standard.  On 1-1/4" size the coupler and adapter is to 1-1/2" standard.  British thread also available. Warning: Do not operate couplings under pressure or with liquid in the lines. To prevent accidental opening fully engage and secure handles prior to pressurizing.